The Tuscan village of Impruneta hosts its 92nd annual Grape Festival on the weekend of September 29-30. The town of 15,000 residents just 10 miles (16 km.) south of Florence on the edge of the Chianti region, known for its terracotta creations, is often overshadowed by its larger neighbor to the north. It was here that Brunelleschi procured the 8 million bricks used to form the great Duomo’s cupola and today the furnaces still produce the burnt orange terra cotta vases, statues and tiles. Every fall Impruneta musters its best resources and bounty of the earth with a weekend filled with Tuscan experiences. Events begin early in September with the raising of neighborhood flags, street markets and traditional dinners. The four districts (quattro rioni) of the town, represented throughout the year by their respective flags prominently displayed, compete in a culinary contest to determine which neighborhood makes the best peposo, Impruneta’s signature dish. This beef stew, generously seasoned with black pepper and red wine, was traditionally prepared by brickmakers in a terracotta pot, and put into the kiln to slowly cook all morning. On the evening of Saturday, Sept. 29, the main square, Piazza Buondelmonti, fills with an display of food and wine. Visitors can sample the local specialties and most likely be entertained by music and dancing. On Sunday the festivities begin with the Impruneta Philharmonic Orchestra performing a program of Giuseppe Verdi (2:30 pm, Piazza Buondelmonti). 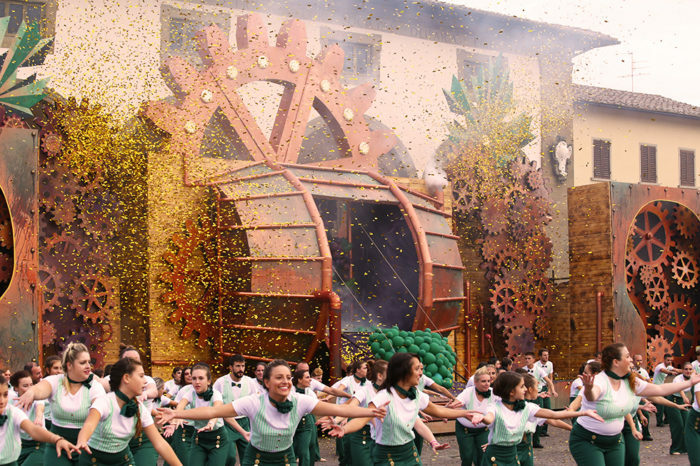 At 3:30 pm a grand parade with floats created by the four neighborhoods and inspired by Chianti wine and the grape harvest begins to wind its way through the streets. Antics and fun based on the local rivalries accompany the floats and culminate with the awarding of the coveted “Vetrina dell’Uva”(shop window) prize and the district’s flag proudly displayed on the city hall balcony. Standing room tickets cost €8; bleacher seats €25.